Just southwest of Orlando and in tranquil rolling landscape lies a beauty in Solivita, an amazing retirement community of approximately 5,000 people. This is a community where golf carts outnumber automobiles. The town center’s cobblestone street in front of the Mosaics Restaurant where the ceremony was held is lined with golf carts. Automobiles are not allowed to park on them. What a great little community! It provided the perfect backdrop for the lakeside wedding ceremony for Jamie and Shawn to exchange vows and to start their amazing journey together. 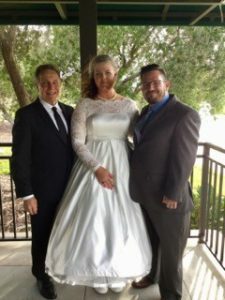 Lon Tosi from the Orlando team of Sensational Ceremonies met with the couple just a few days before their planned event. Together they created a special ceremony that reflected their true love and a bit of humor as well. There was a reading from I Corinthians the popular Blessing of The Hands with its closing prayer that brought tears to everyone’s eyes. The prayer starts with the following verse: “God bless these hands that you see before you this day. May they always be held by one another”. Lon read the Jamie’s favorite reading “On Your Wedding Day for the group of six close friends and relatives. The crowning reading came from Union by Robert Fulghum with it’s beautiful closing verses “for after these vows you shall say to the world, this is my husband, this is my wife”. Samantha Rivera Photography captured everything including the Tying of the Knot which the couple made both serious and humorous! Shawn then pledged his commitment to Ian , Jamie’s son to be the very best father possible, and Ian countered with his acceptance of Shawn as his father figure. That was a touching moment in the ceremony! At the end, Shawn and Jamie included a famous verse from the Dr. Suess piece “Oh The Places You’ll Go” with reads, Kids you’ll move mountains! So be your name Buxbaum or Dowrie or Bass or Mordecai Ali Van Allen O’Shea, you’re off to great places! Today is your day! Your mountain is waiting. So…get on your way!” At that point, the couple walked down the aisle and into their new live together. We wish them so much luck in their new life as husband and wife and family! We just know that the family would be celebrating at the Walt Disney Worldin Orlando on their honeymoon!